edit 3: round 2 emails have gone out, i assume that will wrap it up. appreciate all that participated, warms my shriveled heart. edit 2: so, round one emails have gone out. but round 2 emails will go out later tonight after 6PM, so theres always a chance. thanks for taking the time to enter. edit 1: so, emails are going out. sometimes people ask how it works, the lottery. basically, everyone emails their info to an email account set up for this purpose. sarah goes thru and randomly selects x amount of entries per page. like dis. we have about 375 prints to sell. we have more than 375 people expressing interest. we randomly pick people. pretty easy. 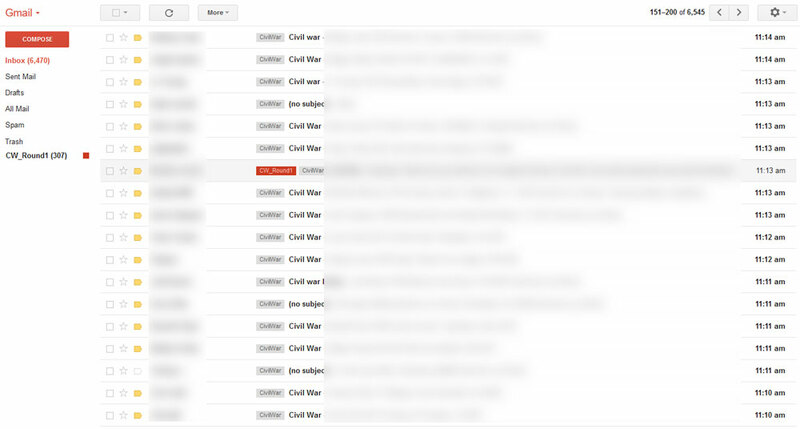 after the sale is over, the inbox is completely emptied of all entries. people worry about being disqualified. the only time we've disqualified anyone, we email them first. we don't check for multiple entries when picking people's email. we only check once they've purchased the print. then sarah goes thru and sees if that shipping address lines up with the address they entered. that's it, super easy. the people that get refunded always are contacted and asked why they entered twice, or weren't picked etc. so don't worry about being silently disqualified over a typing error, its always people that know why they were ineligible. easy enough. and a bit of work for sarah - so go easy on her. all this attention is stressful. looks like we're selling our copies of our poster for Civil War. go here to read more about how to enter, details and whatnot. if you have any questions, fire em off to me. good luck to all. i'll be posting updates as they happen, so feel free to check back here if you're like 'has the first round of people been picked yet' or 'is the sale started' etc.